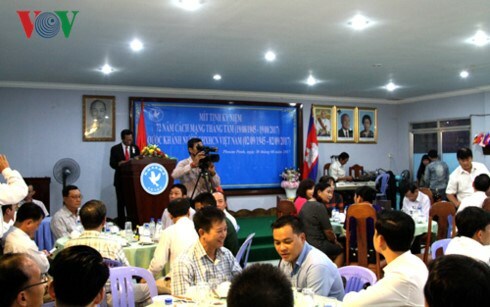 The General Association of Vietnamese-Cambodian in Cambodia held a meeting on August 30 to mark the National Day. Hanoi (VNA) – The Vietnamese Embassy in South Africa on August 30 held a grand ceremony to mark the 72nd anniversary of Vietnam’s August Revolution Day (August 19) and National Day (September 2). Speaking at the ceremony, Vietnamese Ambassador to South Africa Vu Van Dung recalled the country’s historical milestone when President Ho Chi Minh read the Declaration of Independence at Ba Dinh Square 72 years ago, officially giving birth to the Democratic Republic of Vietnam, now the Socialist Republic of Vietnam. The more than seven decades have witnessed Vietnamese people’s tremendous efforts to overcome challenges to protect national freedom and independence as well as promote national construction, he highlighted. The Vietnamese Ambassador underlined that the Vietnamese Party and Government always cherish comprehensive partnership relations with South Africa, hoping that the two countries will further effective cooperation in fields of economy, trade, education, security and defence and environment protection. He expressed his delight over strong cooperation in various sectors between the two nations with two-way trade standing at over 1.2 billion USD in 2016. They are targeting to increase bilateral trade to 3 billion USD by 2020, he added. Meanwhile, Edward Xolisa Makaya, Chief Director for Africa at the Department of International Relations and Cooperation of South Africa stated that both sides need to take advantage of the sound traditional political relations, including solidarity between the Communist Party of Vietnam and the African National Congress party, to bolster cooperation in fields of their demands and potential like tourism, defence and environment. He expressed hope that Vietnam will continue to share experience in agricultural development and poverty reduction and the two countries will bolster coordination at regional and multilateral forums. Vietnam’s traditional cuisine was offered to the participants at the event. The anniversaries were also celebrated at a meeting in Cambodia on August 30 by the General Association of Vietnamese-Cambodian in Cambodia. President of the Association Chau Van Chi highlighted that Vietnamese people community in Cambodia is an inseparable part of Vietnam and they always turn their heart to the fatherland. Meanwhile, Vietnamese Ambassador to Cambodia Thach Du affirmed that Vietnamese expatriates, including those in Cambodia, have played an important part in the country’s robust achievements in the past years.